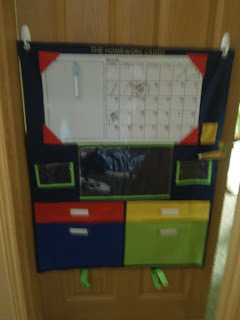 My "thing" has always been organization (especially before having kids). Diagnosed with OCD (obsessive compulsive disorder), I feel the need to put everything in a specific place in a specific order. This has always helped me in my education and different careers. I have my DVD's organized by category again before the kids they were alphabetized, my closet is categorized as well, I even have color coded the hangers (weird I know). But realistically I cannot expect my kids to be the same nor do I honestly want them to develop these same obsessive tendencies Dane has unfortunately already become pretty particular about placement of different items and sticking to a pretty specific schedule and routine throughout the day. This kind of thing really gets me excited as now that the boys are getting a bit older I can hopefully go back to being more organized myself! One of the areas that my parents always drilled into my head and I now am very strict on is education. Too many times parents say its just preschool or grade school, don't worry they'll work harder in high school. (Believe me this was actually said to me a few years back by someone close.) REALLY?!? 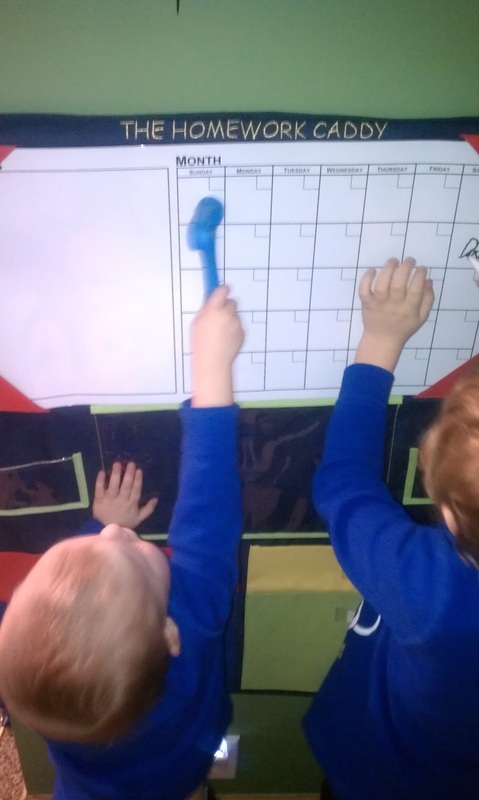 Good habits start young! 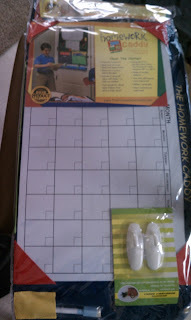 So when I discovered The Homework Caddy, needless to say I was pumped to get my hands on one of their organizers for Dane especially! Designed by a mother looking for some sort of organization to her chaos. 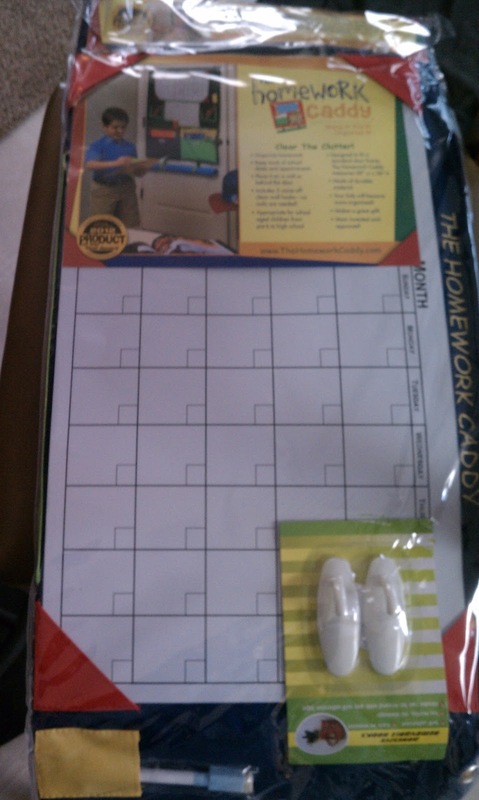 The Homework Caddy "is designed to fit on the back of most standard bedroom or closet doors. It measures 28 inches wide by 36 inches tall." for poster board project storage, 2 Magic Hooks with come-off-clean adhesive. I wasn't quite aware of how wide and large this was when I first ordered one so when we opened it we were afraid it wouldn't even fit on our doors. 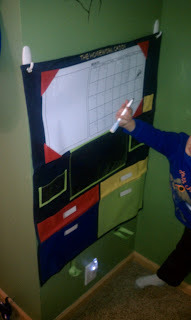 Thankfully we were able to find a bedroom door that it would fit on and we placed it at perfect height that Dane could easily reach it and begin marking off days on the calendar. 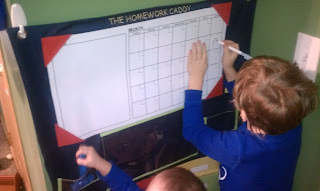 He was thrilled to have this and to keep organized with his field trips and birthday (this past week). With it taking up minimal space and providing quite a bit of organizing space, I think this is a great tool to have for honestly children of any age (even up to college level). Not only does it teach organization but helps teach a child at Dane's age about calendar days and months as well! Recommendation: These are awesome and an OCD dream come true for their children! The price is pretty reasonable in my opinion but I wish there were more than just four designs to choose from, maybe more color options or logos that could be added. Oh my goodness! We need this!! !